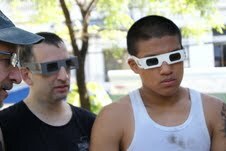 Putting on those funny glasses and watching the proof of our 3D martial arts fight on a video monitor was incredible. It was weird to see an image of myself, leaping out of the screen and jumping back into the fight. It was sort of like the first time you ever saw yourself on a movie screen or on TV, but with 3D it was really unique because you just aren’t used to seeing 3D images at all. 3D in 2010, is what TV was in 1950 or radio in the 1900’s. It is a brand new, wide open opportunity, a chance to get in on the ground floor of the new new-thing. If you kick yourself for not buying stock in Yahoo or Microsoft in the early 1990s, cashing in on 3D will give you a shot at redemption. In July of 2010, director Al Cadullo of 3D Guy TV and Explore World TV filmed a one minute martial arts fight in 3D, with me, (Antonio) and Ulysses Chan, a Muay Thai fighter from Taiwan. The one minute clip was to be used as a proof for his new concept of a martial arts travel show in 3D. Since then, he has begun producing a number of 3D travel shows, mostly for the Wealth TV network in America, which will be going to a 3D format 24/7 in January, 2011. Having worked with Al on several 2D fight scenes last year, and now, several 3D shoots, this year, I asked him what the primary difference was in shooting 3D vs. 2D action. That first 3D fight scene was shot in a park in Bangkok. I quickly learned that shooting 3D is a whole new art and presents a lot of different problems, compared to regular 2D movies. First off, movie sets which work in 2D will not work in 3D because they will look flat. You would be able to see that half of the background was painted on the wall, and that the parts that stuck out were only inches deep. Remember 3D gives real perspective. 2D only gives the illusion of perspective. When we arrived at the shoot, I immediately spied a gazebo which had a roof made of crisscrossed steel. I though, wow! Perfect. We could put the cameraman up there and Al could shoot form bird’s-eye perspective, down through the holes in the steel. But Al explained that if you shot from directly overhead with a 3D camera, the actors would look like they were six inches tall. I suggested that Al could place the camera at a certain point and then use zoom. But he quickly corrected me. “Take the word zoom out of your vocabulary, because the human eye doesn’t have zoom.” That made sense. 3D works more like the human eye. When you have an object in real life, and you want to see it closer, you move your eye closer to the object. And that is what you must do with camera in a 3D shoot. “3D is more honest.” Insisted Al. package for creating 3D computerized mockups of locations, in advance, to help you plan your shoots. During the shoot, the director had to wear glasses to watch the monitor, but obviously, needed the naked eye to watch the actors. There is a lot of juggling in 3D. It is also a good idea to play back every single take, immediately, and watch it with the glasses. If the lighting is off or someone goes partially off screen, the whole image can go flat. And the footage would be unusable. “Action!” yelled Al, and we began hitting each other. Two seconds later, he was already yelling “Cut!” Apparently every time we moved or circled we were going out of frame. Al marked the ground where we needed to fight. The more we filmed, the more I realized how narrow the “in frame” area was and that it was limited not only by breadth but also by depth. Once again, this was 3D, depth TV. Getting too far away from the camera, under the camera, over the camera…left or right, we would go out of frame. But the real no-no was to be half in and half out. The second half of the fight scene consisted of a chase across the playground and a very cool final fight on the sliding board. On the way to the sliding board, Ulysses was chasing me. He leaped up onto a row of park benches, got beside me and leaped off, giving me an elbow to the top of the head. I had wanted to shoot the leap from several angles, including from the ground and from bird’s eye perspective, but it just wasn’t possible. Next, we fought on the sliding board, which worked extremely well for 3D because Ulysses leapt off the board on top of me, dropping both a knee and an elbow on me. Al meant that we were maximizing the technology, but he told me that the future of 3D goes way beyond action and martial arts. For the moment, a martial arts fight scene was perfect for 3D. Unfortunately, however, at this point in time, you can’t just pick up a 3D camera and run with it. You had to cut, move the camera, and shoot the same scene again to get multiple angles. When you cut the action and then restart, in 3D you have to make sure that the actors are in the same exact positions as they were before, including their plane, relative to each other. If we reset the actors incorrectly, the audience would be able to see the distance between them, and the audience would know that the punches and kicks were missing by a mile. “Right now, people want 3D images that jump off the screen and land in your lap.” Said Al, but eventually, he believed that all sorts of shows, from news to game shows would be in 3D. I saw a 3D concert that he filmed and it really was like having a holograph of the band singing in my living room. Two of the shows Al is shooting for Wealth TV right now are Markets and Tastes, a food related travel show, and WOW, a travelogue, showing various cities around the world. The shows have some action of course, but they also have eating and shopping and hotel rooms. So, they are already departing from the frenetic action and lizard-jumping gimmicks. Until we have movies with senses of touch, taste and smell, 3D really does add another dimension to your viewing experience. Al is working on a golf travel show which obviously has stunning images of golf balls jumping right at you and panoramic views of golf courses from around the world. We have also begun filming my martial arts series, Brooklyn Monk in Asia, which is all in 3D. He has plans for a show called Tech Toys which will explore all of the latest gadgets on the market, telling you which are hot and which are not. 3D is the new new-thing, but it isn’t quite ready for independent and student films. “The Blair Witch Project” in 3D is still a while away. First off, the cheapest professional grade Sony 3D camera is $21,000. That is more than the total budget of “Blair Witch.” Sonny is coming out with a consumer-grade 3D camera for just over $1,000, but until we review it, we won’t know if the quality is there yet to make affordable 3D movies. 3D is the radio of the 2000’s. People always said I had a great face for radio, and now I am putting it to work. is the author of the books, “The Monk from Brooklyn” and “Warrior Odyssey. He is also the host of the web TV show, “Martial Arts Odyssey,” which traces his ongoing journey through Asia, learning martial arts in various countries. him a friend request or subscribe. Antonio is also on twitter, with the name, Brooklyn Monk. Follow his adventures and tweets.